After you set up your sheet in Smartsheet, you’ll want to share it with your project team, or collaborators, as Smartsheet calls them. When you share a sheet with collaborators, you’re allowing them to log in to Smartsheet and either view or edit the sheet, depending on the permissions level you assign. Be careful with permissions. You can assign Viewer, Editor, or Admin permissions. Admins and Editors with sharing permission can share the sheet with others without your approval. Make sure you want to give that kind of power to others. Log in to Smartsheet and open the sheet you want to share. Click the Sharing tab at the bottom of the sheet. You see the Sharing dialogue box. Click Add Collaborators. You see the Share Sheet dialogue box, (see Figure 1). 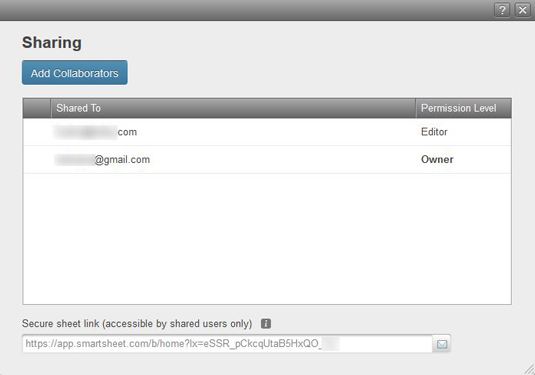 In the Share To field, type in the e-mail address(es) of the collaborator(s) you want to share the sheet with. You can enter multiple e-mail addresses separated by a comma or semicolon. Next to Permissions, select the permissions level for the collaborator(s). Viewer: The collaborator can view and export the sheet, but can’t make any changes to it. Editor: The collaborator can make changes to the sheet, as well as attach files and create discussions; however, editors can’t change the layout of the sheet. Check the appropriate box to allow editors to share the sheet with others. Admin: The collaborator can manage the sheet; however, to have full admin privileges, the collaborator must be a paid Smartsheet user. Next to Send Email, make sure the box is checked to include a link to the sheet in the message. In the Subject and Message fields, type in whatever you need to explain the sheet to the invited collaborator. If you want to be copied on the invitation to the collaborator, click the Cc me box. Your invited collaborator(s) receives an e-mail with the link to the sheet. When the collaborator clicks the link, he or she has to set a password to log in to Smartsheet to access the sheet. Figure 1: Sharing your sheet. If someone loses the link to the sheet, you can resend the secure sheet link at the bottom of the Sharing dialogue box. In fact, it’s a good idea to bookmark this link so that you and your collaborators can go directly to the sheet. To either remove a collaborator or change his or her permissions, right-click on the collaborator’s name in the Sharing dialogue box and choose the appropriate option.